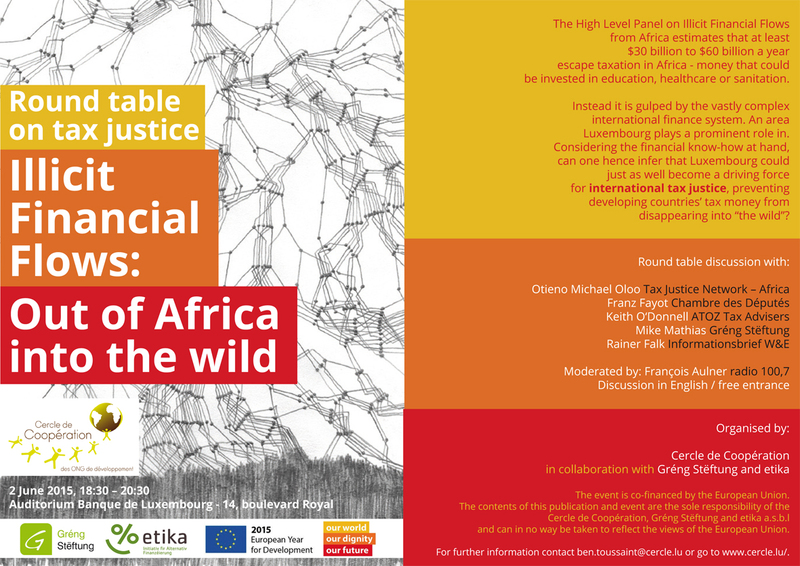 The High Level Panel on Illicit Financial Flows from Africa estimates that at least $30 billion to $60 billion a year escape taxation in Africa – money that could be invested in education, healthcare or sanitation. Instead it is gulped by the vastly complex international finance system. An area Luxembourg plays a prominent role in. Considering the financial know-how at hand, can one hence infer that Luxembourg could just as well become a driving force for international tax justice, preventing developing countries’ tax money from disappearing into “the wild”? The event is co-financed by the European Union. The contents of this publication and event are the sole responsibility of the Cercle de Coopération, Gréng Stëftung and etika a.s.b.l and can in no way be taken to reflect the views of the European Union.